Hibi has decided she wanted pink hair! 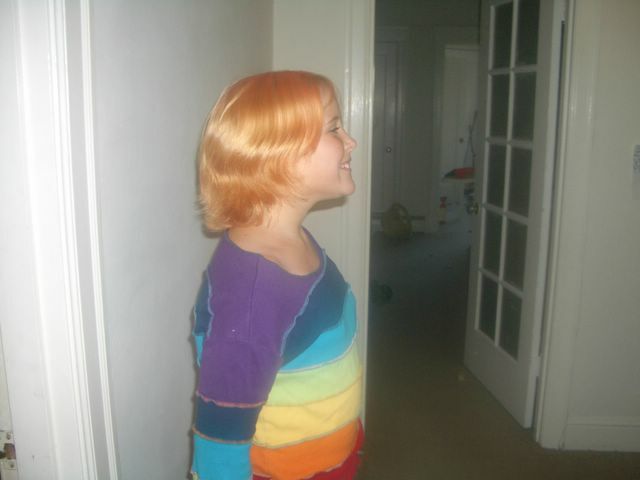 First we bleached it and then we dyed it pink. It didn't come out PINK pink, but it did come out pink. Bovine Freedom is making the rounds again....I didn't have a blog when we saw it before, so I'll post it this time. It's a lot of fun, even if you're not a vegetarian! We've been doing something at the church that's worth sharing here. We call it Community Link, and it's a liaison between the church and elderly shut-ins. What we do is get together as a group at the church--we usually have between 7 and 15 people there--on the third Saturday morning of the month. We make some food--we started out last January by making vasilopita (St. Basil's Bread) which turned out to be too big of a project, and we had problems with the bread being doughy, and I learned not to undertake such a big project in such a short amount of time next time! But I digress.....We make the food, then we share a simple lunch--either what we're making if it's "lunchy" or we bring a potluck meal of sorts. Then we go out in groups of two or three and take the food to people who have been contacted, usually shut-ins, but we also took a vasilopita to a woman who had recently lost her husband, and we're talking about taking food to new mothers, too. The people have been so grateful! They're so happy to see someone from the church, and have someone to talk to for an hour or so. Having the food is a great medium--a way to get in the door, for some who may be reluctant. Here are some of the food items we have made: in February, we made valentine cookies; once we made spanakopita (Greek spinach pie), once some of the Eritrian women from the parish came and showed us how to make Eritrian food, and this last time we just made a Greek salad and paired it with leftover tiropita (Greek cheese pie) from the Greek festival the previous weekend, and Greek cookies. One real advantage is being able to find out the needs of the community. We've been able to find out which people don't have a way to get to the doctor or the grocery store, for example. I think there are probably plenty of people willing to help out when needed, if they just know that help is needed. Here is a way of getting that word out. I'd like to share the story behind the Vasilopita--St. Basil's Bread: St. Basil was a bishop who lived in the fourth century. He wanted a way to help relieve the vast poverty he saw all around him, but didn't want to shame the poor people by handing them money in front of everyone. So, he began to bake loaves of sweet bread with money baked into it, and gave them out to people in need. We still bake money into it--usually a nickel or quarter, but I like to bake the Sacagawea dollars into mine. They're washed very well, and wrapped in foil so as not to contaminate the bread. :-) Nowadays, we eat the bread as a group--either as a family or a church group. As the bread is cut, everyone hopes they will get the piece with the coin in it, because that signifies good luck for the year (it's eaten on St. Basil's day, which is New Year's Day). I think it's a nice tradition. 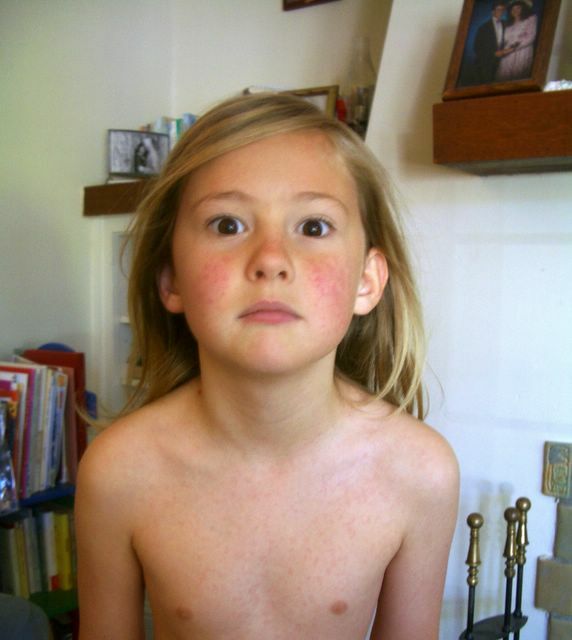 Zac woke up yesterday covered with a rash. I first noticed his cheeks--they were quite red, and upon closer inspection I saw that there were little red bumps on them. I took a look at his torso and sure enough, the rash was there, on his front and back, and on his arms. I did a lot of checking on the internet and asked the wealth-of-info folks on the home-ed list about it, and the conclusion I came to was fifth disease. I thought it was possible it was rubella, too. Took him to the doctor today just to confirm, and to find out if he's contagious. Yes, and yes. She thinks there's a possibility that it's rubella, just because she's not seen rubella (she's a young doctor), but that she'd put money on fifth. If fits, certainly....there are no symptoms except the rash. But the virus can be very bad for fetuses....and there are two pregnant women in our homeschool group, and Zac played with the son of one of them last Monday....I already alerted her. It is good that no one that I know of is in early pregnancy. So, we'll be mostly staying home this week! Zac is enjoying being pampered, because even though he doesn't feel sick he can't do things like go to the library and get his own books on tape, so....I'll be doing that for him. I just hope I don't get this! Oh, yeah....Paul might have it, too. I first noticed a rash on Paul in the late afternoon on Saturday--just on his arm and back. Yesterday it'd spread to the whole back and the other arm, as well as the top of his scalp. Ferry Building: they've renovated the old ferry building and put in all kinds of food shops. It reminds me of Paris. There are produce shops, oil shops, chocolate shops, wine shops, bread shops, cheese shops, restaurants, and cooking shops. And on certain days there is a huge farmer's market, which includes food from famous restaurants on Saturdays (maybe Sundays, too? I don't know.) Tuesdays and Thursdays there are also markets, but I think those don't go year-round and aren't as big. Oh, yeah--you can also catch a ferry to Sauselito there. North Beach: home of City Lights Bookstore, where the beat poets hung out. Great neighborhood for wandering around in. Stop by Stella Bakery for some wonderful Italian pastry. This is the Italian district, and there are tons of Italian restaurants that we haven't been to. The one we have been to is Rose Pistola, which was wonderful, but *not* for when you're looking for cheap eats. Telegraph Hill: we watched the movie The Wild Parrots of Telegraph Hill, and loved it! When Paul's parents were here, we saw it with them and then went looking for the parrots. We had a great walk in the staircase neighborhoods of Telegraph Hill (don't know how the residents do it, having to take a long staircase to their homes instead of driving right up) and then we finally found them. Someone had told us "you'll hear them before you see them." Boy, that was true! They are very noisy! It was really cool to see them all. Valencia St.: lots of great stuff on Valencia. Dog Eared Books, a used bookstore (some new stuff too), Herbivore, an all-vegan and all-delicious restaurant, 826 Valencia, otherwise known as "The Pirate Store" (in case you don't have a pirate supply store in your town), a cycle shop, lots of great restaurants including a very fresh taqueria called El Mariachi (I think). We just ate at Pauline's Pizza last week, and really enjoyed it. They use fresh-from-the-owner's-garden ingredients. We had a pizza with artichoke hearts and lemon puree! Where else can you get lemon puree on your pizza, I ask you? 24th St. in Noe Valley: lots of wonderful shops, including the Global Exchange store (all fair-trade stuff), The Ark--a toy store, a kids consignment shop, lots of clothing stores, a good cheese shop. Irving and Ninth Ave. area: great restaurants in this area, our faves being Masala (Indian food) and Park Chow. The Archangel Bookstore is an Orthodox book and religious supply store on 9th, kind of a cool and quirky place to go. Museum of Modern Art is fun. Academy of Sciences is cool, but they're renovating their building and in temporary quarters right now, much smaller. Normally they have an aquarium and a planetarium, plus other cool science things. Speaking of science...Exploratorium, of course. If you are a kid or just like to play around with stuff, you have to visit Exploratorium. Everything is hands-on. On nice days, we like to go to the beach. Our favorites are China Beach and Crissy Field. We can take the streetcar to Ocean Beach at Taraval easily, so we do that sometimes. There is a nice beach on the bay right across from Ghirardelli Square, so if you want to be touristy and get beach time in, you can. There is a cool little Cable Car museum that's fun to go to once, and it's free. You have to take the cable car there, of course. Fattoush: a Meditteranean restaurant on Church St. in Noe Valley. Extreme Pizza: they deliver and they do soy cheese. Plus it's great pizza. A small chain--we first ate at an Extreme Pizza in Fresno. Cafe Gratitude: for when you're in a quirky mood....it's a raw-food, vegan place. Everything on the menu starts with "I Am..." The pizzas are "I am Passionate" and "I am Magical." Gave me a start when the server put my smoothie in front of me and said "You are Beautiful...." until I figured out that the name of the smoothie was "I Am Beautiful!" It's pretty good food, all things considered. Chow: I mentioned Park Chow--this is the original one. On Church St. near Market. I reviewed it here on July 24. Mezes: A Greek restaurant that does only Mezedes (appetizers). Scrumptious! Roti, also on West Portal--another great new Indian food restaurant. We love using Muni to get around San Francisco. In some cases, it takes a lot less time and headache to take the train or bus, than to drive in a harried barely-moving traffic jam, circle round and round looking for a parking place, then pay big bucks for parking. Pick up a Muni map at lots of businesses, like Walgreens, and use it to map out your route, or go here to have the computer do it for you. Fares are, as of September 1, 2005, $1.50 for adults and 50 cents for under 18 and seniors. Coyote Point Museum. They have rescued animals that can't make it in the wild anymore, plus a great exhibit that shows the environmental impact that we're having on the earth and the ways we can go easier on it. Point Reyes: Beautiful natural setting, north of San Francisco across the Golden Gate Bridge. Lots of hikes. We like the earthquake trail. Pescadero State Beach: south of Half Moon Bay--probably takes us about 45 minutes to drive. A beach with lots of rocks that catch the wildlife in tidepools as the tide wanes. Last time we saw plenty of anemones, sea stars, an array of mollusks, and a sea lion played near the shore all afternoon. Berkeley: yeah, you've heard all about weird Berkeley. Now go there and see how cool it is. :-) Chez Panisse is in Berkeley, Alice Waters' restaurant. Definitely worth a special-occasion visit. My own cooking has been highly influenced, indirectly, by Alice Waters' emphasis on fresh, local flavors. Mmm......When we were at Patrick's Point, the kids went out one day and looked for huckleberries, like all the other kids. They came back with two cereal bowls filled with tiny huckleberries. They said they were going to make a pie, and that I wasn't allowed to use them! But they never did, and when it was time to go home, I just dumped them in a jar and brought them home. This morning, Zac (who has a burgeoning interest in cooking) was brainstorming over what he could help me make for breakfast. I thought of pankuchen (which we often make with apples) with a fruit topping, and he said "let's make huckleberry pankuchen!" So, he came into the kitchen with me and we both stemmed huckleberries for quite a while. They're kind of a bear to deal with, since they're so tiny, but having help was nice. Then we cooked them up in the oven pancake. The result was beautiful and delicious! I didn't have the presence of mind to take a picture before we ate it, but it was sure good. It smelled like blueberry muffins while baking, but really had a distinctive taste. Turn on the oven to 400. Put three tablespoons butter into a 9X13 pan, and melt in the oven. Wash and stem 1 1/2 cups (approximately) huckleberries (can use other berries). Blend together: 3/4 cup milk, 3/4 cup flour, 3 eggs, and 6 tablespoons sugar. When the butter is melted, pour the berries in a layer over the butter. Sprinkle liberally with sugar, especially if the berries are tart. Pour the batter over all and bake about 30 minutes until puffed and browned. Enjoy! I usually like Jon Carroll, but when he's good, he's really good. Today's was excellent! He gets cranky about some of the same things I do. "With no one having any way to choose anything because God is sovereign and all, and with all things working together for the good of the Elect, I wondered if something might fall on where Janet had been sitting that would have split her head open or cut her arms off since all things work together for good for those who love Him, and then we'd know why this had all needed to happen to spare her or something." This book is so human, so real. It's really worth the re-read. Wow. So we went out and bought the new Indigo Girls CD, and I love it! Usually it takes a few listenings to start liking a new one, but not this one. But it's a very different album from their usual. First, it's a way different sound. They have taken songs from a lot of different sources, where usually it's mostly songs Amy or Emily have written. Here, you can see who has influenced them. One song is Emily's from her college days, and they recorded it way back in 1986. Boy, they've changed! One song is a Woodie Guthrie song, and they're singing it with Ani DiFranco. That one's one of my favorites. The weirdest, craziest one is Shed Your Skin, which as they note in the album notes, is already a departure from their usual style, but they let Tom Morello from Rage Against The Machine remix it. Wow! That's sure a different sound for them. They also remixed Ghost and Free In You. The latter of which is in kind of a techno style now, along with other styles mixed in. I like it, but Paul doesn't. He likes the Rage remix. (He's secretly--or not so secretly now--a Rage fan, and has even gotten our children to like it....I'm the only holdout in the family.) Lots of other artists come into this album, both in lending their songs and in lending their voices. It's a remarkable album. The only criticism I have of it is that some of the songs feel somewhat unbalanced--like they're not an organic whole. I notice this especially in songs that have been remixed--even if I like the remix. There's even a song about revolution, written by Ferron (I'm unfamiliar with this artist). Here's what Amy Ray says about her: "As a songwriter, Ferron has never gotten her due from the music industry. She is absolutely stellar. Her lyrics are just brilliant and if the media wasn't so straight, more people would know about her." I have a feeling there's a lot we'd know and like, and that we'd be different people, if we didn't get fed what we're supposed to hear. Listen to clips of the music at Amazon and then go buy it from your local independent music store. Today we've been listening to a CD, from a musical group we heard on Prairie Home Companion. They're called the Wailin' Jennys, but I think they should change their name because there is no wailing in their sweet tones. (I understand that it's intended to be a pun, but....) It's achingly beautiful music. We got it from the library, but we may just have to buy the CD. You can find out about them here: The Wailin' Jennys but I don't see any music clips there. go to Amazon to hear music clips. In other music news, we are really behind the times with our very favorite group, the Indigo Girls....we just figured out today that they released a new CD, Rarities, in June! And Emily Saliers of Indigo Girls also released a book co-written with her theologian dad recently. Very cool. Ordered from Powells already. We had such a great time on our campout! 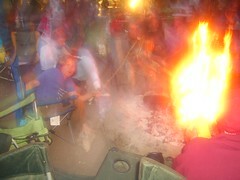 Here you can see the group sitting around the fire--some knitting, some reading, some chatting, some playing. Zac is all the way on the right. I thought this was a cool shot. Somehow the camera got stuck on time lapse mode, and I took this great picture with it. Paul and Hibi are in the picture, along with others. 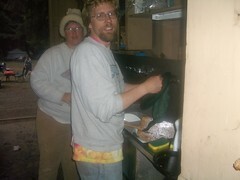 I thought if anything needed to be saved for posterity, it's the picture of Paul washing dishes. :-) Honestly, he did a great job helping with everything over the week--he washed dishes after every meal and sometimes helped a bit with meal preparation. I decided to bring stuff for tie-dying to the campout, as I wanted to tie-dye myself and I don't have a good place to do it here in San Francisco. I brought enough bandannas and hankerchiefs for everyone to dye. It was such a hit that we did it twice during the campout. Here's a goofy shot that Hibi took of me holding a dyed hankerchief! 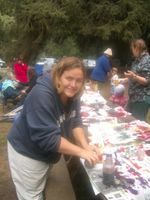 Annie tie-dying, with Kathy in the background. 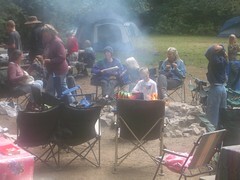 We met so many cool people at the campout. It's worth all the dirt and inconvenience just for the neat conversations and the singing around the campfire (though we did greatly miss Bruce being there to lead singing--he knows the best songs and can play guitar along with the singing). We didn't spontaneously decide to attend Glide Memorial Church this morning. But it was the very best place we could have been on this particular day. I haven't blogged anything about the hurricane victims before now. Partly because we were so overwhelmed with Mark's death and funeral, and partly because the initial reports we were hearing said that the hurricane was really becoming not a big deal and there would be very little damage from it. I don't know where that came from, but obviously it wasn't true. As we heard more and more about the damage, death, and suffering of the people in New Orleans, we've become more and more concerned for the situation. Thank God most of them are evacuated now, and I hope they are in a dry place, one where there is plenty of food and water and where they can clean up. Hibi, Zac, and I have been to Glide church several times in the last few months, and really loved it. Glide is a church that's in the tradition of the black church, but they let white folks in too. It's probably around half black. It's a wonderfully open, affirming, joyous place to be, and I always feel better when I've gone to Glide. I've been wishing that Paul could come with us to Glide, but he's otherwise occupied with his priestly duties on Sunday mornings. But we've been planning for a couple of months that when he went on vacation, we'd go to Glide together. While we were singing, there were photos up on the wall of New Orleans....the damage, the devastation, the people desperate for help, the hope. I couldn't sing right away because I was so choked up. It was incredibly moving. The service continued, using water as the theme of most of the songs. It reminded me that while water can be damaging and hurtful, it can also heal. We need water. We cannot live without it. 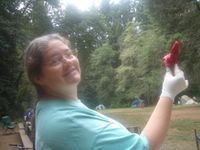 We are heading out in the morning for a week-long camping trip in northern California, with our statewide homeschool support group. We're also going to head up to Ashland, Oregon for a night, to see Love's Labor's Lost at the Shakespeare Festival there. We expect to have lots of fun! See you when we get back.